Easy way to crochet a hat for a woman or a child. This fast and easy to stitch crochet hat can be made in a few hours as a gift or just like a new handmade piece of work for your wardrobe. In this part of the tutorial 2 we continue the work and crochet 6 more rounds of double crochet stitches which is a body part of a hat. You can make more or less rounds in a body part. 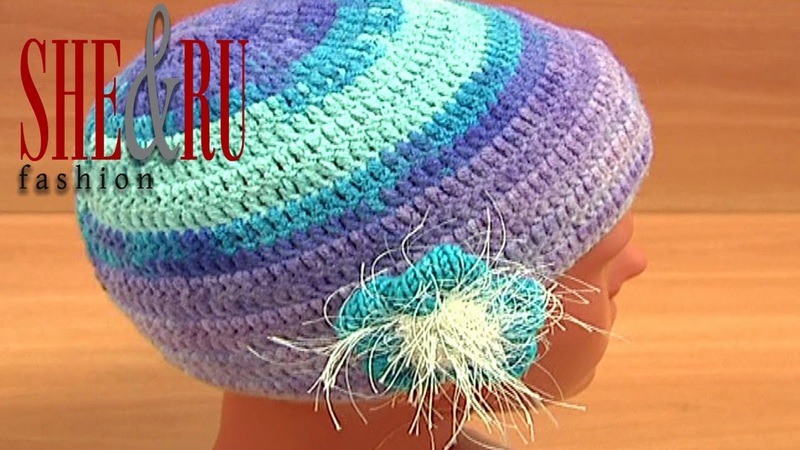 This crochet hat was made of variegated yarn to get very unique and beautiful color mix. This pattern was originally created for an adult female so once you are done with a hat you can embellish it with handmade flowers and leaves, or beads and buttons. The tutorials for many beautiful crochet and knitted flower and leaf designs you will be able to find on our Sheruknittingcom YouYube Channel. Please subscribe! This crochet hat was made with Steel Crochet Hook size 2.25mm or 2.00mm (#2 US standards or #4 US standards) and yarn: 55% Cotton, 45% Polyacrilic, 160m in 50g.